OZ KNOZZ (pronounced oz ka-nozz'), has been on the Music Scene for many years, touring and opening shows for the likes of Supertramp, Kansas, Peter Frampton, Point Blank, and Judas Priest, to name just a few. In addition, they have headlined many of their own shows, building an almost fanatical fan-base over the years. 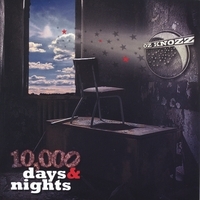 OZ KNOZZ is pleased to announce the release in June, 2008, of their new CD, "10,000 Days & Nights". This project is the culmination of over three years of work, recorded and produced by the band, mixed by former Diamond Recording Studio Engineer Gregg Gill (www.diamondrecordingstudio.com) and mastered by Award-Winning Master Engineer Jay Frigoletto (www.promastering.com). The CD contains eight original tracks, full of the signature keyboard sounds OZ KNOZZ is known for, as well as powerful lead guitar, full vocals, and a driving rhythm section. The eight songs on the CD are all different from each other, from the more "commercial" sounding "You Can't Win", through the progressive "arena rock" sounds of "Graven Image" and "Hear What I'm Saying" to the hard-driving "Hi Fi", and the heavy "Who's The Hero", which is slightly reminiscent of Ronny James Dio. The band even evokes some of Queen's vocal harmonies in the middle section of "S/M Woman", but make no mistake, every song is pure "OZ KNOZZ". This project started out as a way for OZ KNOZZ to archive some of the music they have written and performed over the years, but as the band spent more time and effort with the project, it seemed to take on a life of its own, and the new CD is the end result. The title,"10,000 Days & Nights" comes from the amount of time that has passed between the first OZ KNOZZ album, "Ruff Mix" and the current release. "Ruff Mix" was released in May of 1975, and incredibly, is still enjoying sales worldwide! Hopefully, "10,000 Days & Nights" will achieve the same level of success! FANS - Please checkout Oz Knozz page and sample / purchase some great new music! Radioindy is pleased to announce that we have published our CD Review for Oz Knozz to YouTube.com. “10,000 Days & Nights” is the impressive new release from Oz Knozz, a polished progressive rock band from Houston, Texas with a radio-ready sound. Their approach is highly melodic and characterized by heavy synthesizer work, hard driving guitars, solid grooves and wonderful lead and harmony vocals. The commercial “You Can’t Win” is a great example of their captivating hooks, great vocal harmonies and powerful guitar riffs. The production is very professional throughout, producing a refined, marketable sound. “Hear What I'm Saying” and “Graven Image” are further illustrations of their signature keyboard sounds, multi-layered guitars and full, melodic vocals. The aggressive “Hi Fi” features the drums upfront, with a strong bass line and muscular guitar work providing a forceful, heavy groove. Fans of progressive and arena rock from the likes of Kansas, Europe, and Emerson, Lake & Palmer will definitely enjoy this release. RadioIndy is pleased to present Oz Knozz with a GrIndie Award for the CD "10,000 Days & Nights"
RadioIndy is pleased to announced that we have published our CD Review of Oz Knozz's music to CD Baby. FANS - Please checkout Oz Knozz's CD Baby page here and sample / purchase some great new music! Oz Knozz Press Release on Digg.com! FANS: Increase the popularity of this DIGG press release by visiting our homepage at www.radioindy.com and looking for the "Press Release" section in the lower right. Here, you can find and "DIGG" this press release for Oz Knozz. Oz Knozz on Rhapsody online! RadioIndy is pleased to announced that we have published a music playlist and CD Review with Oz Knozz's music (and similiar Big-Name Artists) to their Rhapsody artist page. FANS - Please help our Radioindy artists by visiting their rhapsody page and playing their music to help generate royalties for the band. Anyone can listen FREE at rhapsody online (up to 25 songs per month FREE) without signing up for an account or even accepting a free tiral. More details. Visit Rhapsody online today and help our Radioindy Gold Artist Oz Knozz! Radioindy has published Oz Knozz CD Review to lala Music Online. FANS - Please checkout Oz Knozz la la and play / purchase some great new music! Radioindy has published Oz Knozz CD Review to Payplay.com. FANS - Please checkout Oz Knozz Payplay page and play / purchase some great new music!